THE CONCEPT OF A HOLLOW EARTH IS A THEORY THAT REFUSES TO DIE! 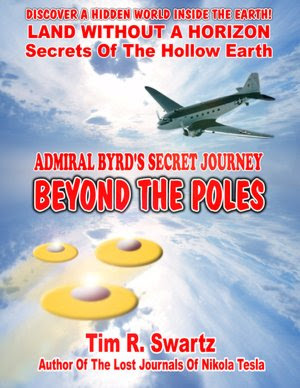 Explore the bizarre world under the Poles! Journey with renown researcher Tim Swartz as he attempts to unravel Admiral Richard E Byrd's mysterious journey to find a secret subterranean world! Here is evidence that the great adventurer actually ventured beyond the poles into a rich land inhabited by a race of superbeings as well as possibly refugee scientists and SS members of Hitler's dreaded Nazi regime. EXAMINE MANY CONTROVERSIAL IDEAS, INCLUDING: 0 How the world was formed. 0 The existence of the mythological lands of Hyperborea and Ultima Thule. 0 The development of the Flying Saucer. 0 The mysterious lands and people of the Far North. 0 Operation Highjump - Antarctic Attack! 0 Did Hitler Escape to Antarctica? 0 Britian's Secret War at the Poles. 0 Did an Inner World race give the German's UFO technology? This is a large size - 8.5x11 book with easy to read text and contains many important illustrations, art work and documents for the serious student to study.